If you’re going to remove the heads flip them over and smooth the dog leg that the oil travels to get to the top of the heads. It’s easy and free (except a little time). I’d do it BEFORE you take your heads to a shop. That way when they boil them they’ll get rid of any shavings you might have missed. I woiuld take a compression check before tearing it down. 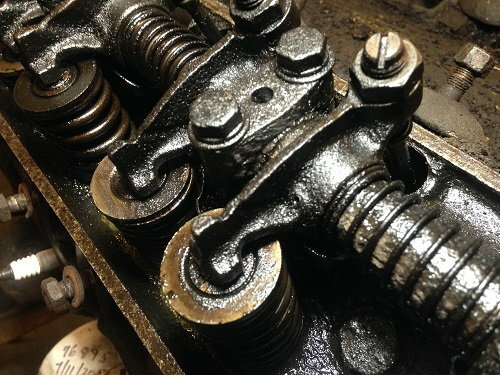 These engines actually held up better in commercial trucks as they were run for longer periods, warmed up and usually did not develop as much sludge as cars and trucks drove shorter distances. a beer truck driver friend had one still running strong at 150,000. I would definitely pull the valve covers. If very clean, drive it, If not do as you planned. todays oils - synthetic are so much better, that these engines would not have the trouble they did with the old oils. For what it worth I had my 55' 239 rebuilt. I got my parts from Egge and was happy with the quality. I did not get all the parts in the kit, only the ones my shop guy suggested that I needed. Cost came in around 3K. Parts and labor. Here is the link to that Kit. So I pulled a valve cover again to get some pics. These don't look too terribly bad to me... What do you think? Not bad at all. 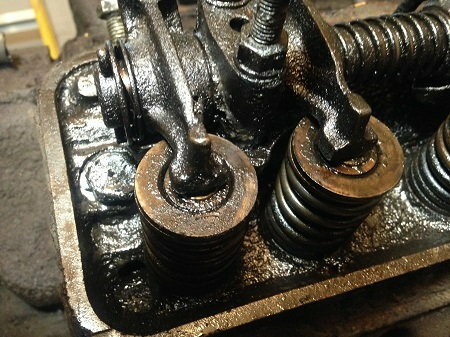 The light colored stuff around your rocker arm springs is from the engine running cold. I’d get it good and warm, change the oil and drive it. You can leave the valve covers off to check to see how they are oiling. Be sure to adjust the the valves while the covers are off too. There are a couple of uTube videos by Mctim that maybe of some help. Is a '55 239 y-block and a '55 239 L head the same thing?
"""""" QUESTION ABOUT RIMS """"""
Quick Reply: 239 Y-block "refresh"?